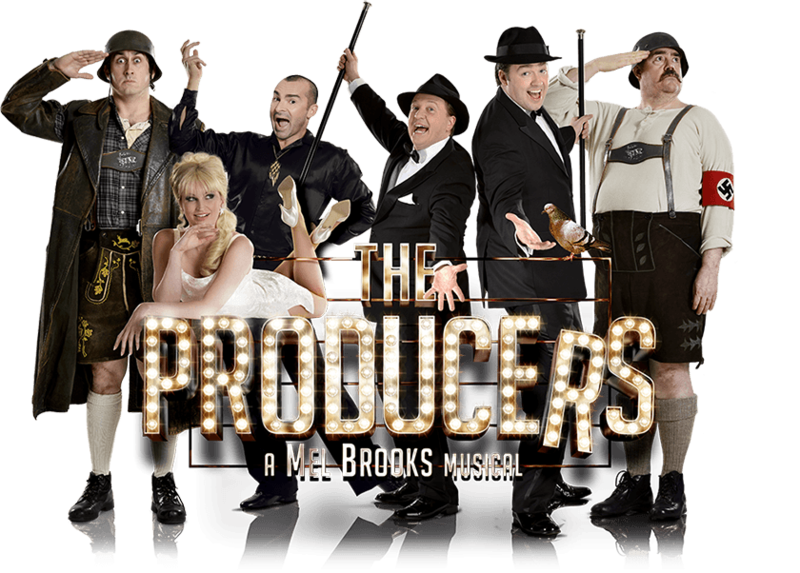 I had the pleasure of seeing the Theatre Royal, Drury Lane UK premiere production of The Producers a decade ago – with the star power of Nathan Lane and Lee Evans. 10 years on and a new production has just started touring. How does this production measure up to the blockbuster original? I need to confront the unavoidable fact that the original UK production was staged in one of London’s largest and most prestigious theatres, the legendary Theatre Royal, Drury Lane – and the producers had lavished money on the production in general and the set in particular. The set looked a million dollars and probably cost twice that. Add to that the buzz generated by the last minute disposal of the planned star, Richard Dreyfuss, due to his apparent inability to cope with ‘the rigours of the role’ and the frantic parachuting-in of the Broadway star Nathan Lane. It was unquestionably the hottest ticket in town to the biggest show in the West End. Last week, I found myself entering the late 70s concrete Churchill Theatre in Bromley. I don’t wish to denigrate the Churchill. It’s actually a fine venue, seating 785 with comfortable seating and a wide stage and auditorium, ensuring a good view from all seats. It was even opened by the Prince of Wales. It is not the Theatre Royal, Drury Lane, though. I was concerned that this would impact my perception of the production. This wasn’t helped by the fact that the houselights were not turned down until half way through the song Opening Night, which did not inspire confidence. The set was in stark contrast to the London original. Where no expense had been spared in the West End, it seemed that almost no expense had been incurred in Bromley. It was serviceable and a fairly clever use of limited resources, but the most positive I can really be is to say, somewhat euphemistically, that the set met the brief of being easily transportable and financially-appropriate for a touring production. This, however, is the last negative thing I have to say about the show. Let’s leave any value-engineering aside and look at casting. The producers have done a clever job of deploying resources cannily to create an all-star-cast effect. Whereas Nathan Lane was paid a Premier-League footballer weekly wage, the touring version has used its budget more cleverly, in many ways. The role played by Nathan Lane, Max Bialystock, is now played by Cory English. English has plenty of experience in the role, but is not a household name. But Jason Manford is cast as the ostensible lead (despite Max being, surely, the lead role if you had to pick one). Manford is undoubtedly a big and credible name. But they add Phill Jupitus as Franz Liebkind – Jupitus’ Never Mind The Buzzcocks profile makes him almost too big a name for a secondary role, furthering the sense that this is an all-star outfit… ‘If they can afford Jupitus for that role, well then they’ve spared no expense….’ Finally, they cast Louie Spence as Carman Ghia in what is generally, a fairly minor role, with the same logic applying as Jupitus. It creates an impression that this is an ensemble, rather than all the budget being spent on just one big name. I suspect that this will generate good box office. Jupitus, incidentally, will be replaced by Ross Noble later in the tour. 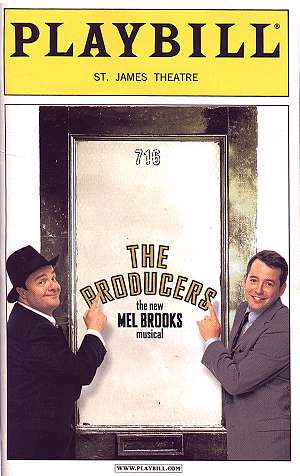 One thing I had forgotten about The Producers is just how long it is: just shy of three hours. This necessitates a fairly pacey direction, to ensure energy levels stay high. Here, Matthew White hits the spot perfectly. At no point did the action flag or the energy sag.Throughout, energy builds and, as with any good farce, the laughter level keeps rising with each passing scene. Cory English is a wonderful Max. While I don’t think anyone will ever be an acceptable substitute for Lane in my eyes, with Lane’s stunning physical comedy and timing, English is the closest you can get to Nathan Lane without actually having Nathan Lane. They look similar on stage. The sound, however, is eery. I know the soundtrack off by heart, but if you close your eyes, it is nigh on impossible to tell the difference – the mimicry of Lane’s voice is uncanny. His performance is excellent. 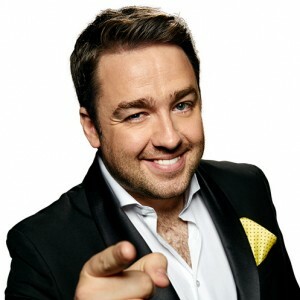 Alongside him, Jason Manford is a revelation. It will surprise no-one to learn that he covers the comedic elements of the role perfectly, but his acting skills are more surprising. For Leo to work as a character, he has to be slightly pathetic, without over-doing it. Jason captures this to a tee and is highly sympathetic without losing the funnies. His singing is the real surprise, however: who knew he was that good? He could absolutely play musical roles requiring top-notch singing, rather than comic timing and a vague ability to hold a tune.The two develop a strong chemistry, which will likely improve further as the run continues. The premise of The Producers, is that Leo, an accountant who secretly wants to be a Broadway producer, is sent to audit the books of Max, a cynical producer whose best days are behind him. Leo works out that, with the right conditions, Max could make more money with a flop than with a hit and the two hatch a plan to put on Broadway’s biggest flop. They find the worst play ever written – a jolly musical called Springtime For Hitler, written by an escaped Nazi, Franz Liebkind. With that secured, they seek the worst director in town, and find him in Roger DeBris. Jupitus is clearly having fun as Franz. The accent does appear to tour as much around Europe as the tanks in Springtime for Hitler, but he brings a sympathy to a character with whom it is difficult to relate. He’s a comedy veteran and it’s no surprise that he can show stage presence and excellent comic timing. Roger DeBris is played by David Bedella. He plays the role with confidence and a velvety bass voice and leads the song Keep It Gay marvellously – the audience loved it and this song is a crucial moment in taking the energy level up. Louie Spence plays Roger’s ‘common law assistant’. If the man is payed by the flounce and pirouette, then he’ll make a lot of money on the tour. I was wary of how he might work in the role. I needn’t have worried. He is the definitive Carman Ghia and I can’t imagine anyone else ever measuring up. To say that he has crossed the line into over-the-top is to miss the point. He has not gingerly crossed the line: he has nicked Evil Knieval’s bike, gone backwards 100 yards, taken a full-pelt run up and then leapt 500 feet across the line. But he does it with such confidence that it works brilliantly. Tiffany Graves plays Ulla, the Swedish assistant to the producers and object of their desire. Her big number, When You’ve Got It, Flaunt It, brought the house down and features a clever change from one bikini to another behind curtains but with no visible movement of her hands. There is a moment in the song where she has to switch from comic singing to volume and technical singing, telegraphed by the lyric ‘now Ulla belt…’. This requires a performer who can dance and be funny and then, in a split-second, switch to full-bodied high-note show-off singing. I am a big Uma Thurman fan, and while she was a fine Ulla in the movie, this moment was beyond her capabilities on the movie soundtrack and doesn’t quite work. Tiffany Graves is more than equal to the task. You probably need to know the piece quite well to look for that telling moment, but if you do, Tiffany nails it. Paul Hutton, as Scott the Choreographer, is a joy. I will never be able to see a purple leotard in the same way again. During the final notes of Keep It Gay, he does a shimmy which had me (and others) howling with laughter. Blink and you miss it, but it’s one of the funniest things I have seen in a long time and had me giggling all the way home. The man should be given a much bigger role in the future. The ensemble is universally excellent and will no doubt enjoy the tour. Genevieve Nicole in particular stood out for me with consistently high-energy dancing, but the team are all worthy of great praise. I often feel that the quality of the ensemble can make or break my overall perception of a show. This group certainly hit the spot. Overall, a wonderful production. Lee Proud’s choreography is extremely good: efficient and not showy, but energetic and fun and like all good design, understated – which is the only place you will see that word in the context of The Producers! Andrew Hilton takes on MD duties and his band excel. So: it’s not The Theatre Royal and there’s no Nathan Lane. I was worried that I might find reasons not to like this production, but I need not have worried. It sweeps you up and makes you enjoy yourself. The play is a wonderfully-scripted farce and this production is well-cast and directed to maximise fun while moving the action along with perfect pacing. It has now moved from Bromley to Manchester and will continue to tour the UK in the coming months. This entry was posted in Uncategorized and tagged Bromley, Carman Ghia, Churchill Theatre, Cory English, Franz Liebkind, Genevieve Nicole, Jason Manford, Leo Bloom, Louie Spence, max bialystock, nathan lane, Paul Hutton, phill jupitus, Roger DeBris, Springtime For Hitler, the producers, theatre royal drury lane, Tiffany Graves, Ulla, Uma Thurman by showbusinessinsights. Bookmark the permalink.